PvP night was a lot of fun last night. We opened with an impromptu world defense session. A man named Bregore was raising the alarm as the Horde had just sacked the Exodar, and were on their way to Darnassus. 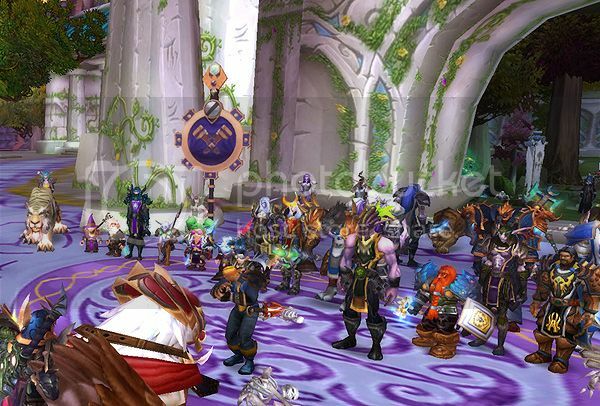 We joined up with Bregore's defense raid of Darnassus. Four gnomes from G4, and several other random Gnomes made up a recognizable portion of the defense that eventually pushed the horde out of Darnassus completely. After we kicked the horde firmly in the rear, we retired to the cottage of Mr. Agee Tyler. Mr. Tyler was kind enough to host our dueling event. What followed was a display of fighting fury that would make any gnome proud. After many tenacious battles, and impressive displays eventually one Gnome emerged supreme for the night. Forbidra carried the evening with her patented technique of setting Gnomes on fire. A special shout out to one of the most memorable duels of the night for me, would be Lugha's duel with Tridyna during which she accidentally detonated the Exploding sheep Tekton, and threw Tridyna off the mountainside. The dual continued though and Tridyna returned and battled to victory. Next week we will be doing a little bit of organized PvP. So get your battleground faces on, and see if you can at least download Vent. I know not everyone has a Mic, but being able to hear and coordinate will go a long way. Finally there are two other things. First if you have a lot of PvP experience and are willing to answer questions about your class or any specific class, please let me know. I already have a lot of gnomes with questions. Second, I will do my best to dig up Video, and regular guides for each class if you have specific questions regarding what you should be doing. Just let me know and I will post up what I can find.